An operational amplifier is an integrated circuit that operates as a voltage amplifier. An op amp as a differential input. That it has two inputs of opposite polarity. An op- amp as a single input of opposite polarity. 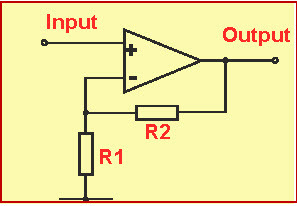 An op-amp has a single output and a very high gain, which gives that the output signal. Operational amplifiers can be used in construction of active filters, providing high pass, band pass reject and delay functions. The high input impedance, gain of an op-amp allow straightforward calculation of element values. If all these resistors all of the if same ohmic values, That is R1=R2=R3. Then the circuit will become Unity gain differential op amps. Generally, we use differential amplifier that acts as a volume control circuit. 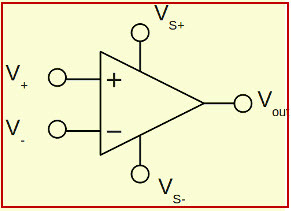 The differential operational amplifier can be used as an automatic gain control circuit. Some of the differential operational amplifier can be used for Amplitude modulation. An inverting amplifier is a closed loop circuit the operational amplifier circuit is connected with the feedback to produce the feedback operation. When dealing with op amplifiers there are two very important rules to remember about inverting amplifier, these are no current flows to the input terminal. And that V1 is always being equal to the V2. However, in real world op amp circuits both of these rules are slightly broken. This is because the junction of the junction of the input and feedback signal is at the same potential as the positive input, which is at 0 volts or ground then the junction is a virtual earth. Because of the virtual earth node the input resistance of the amplifier is equal to the value of the input resistor, R in and the closed loop gain of the inverting amplifier can be set by the ratio of the two external resistors. The differential input voltage is 0 as V1=V2=0. Inverting amplifier is applicable for the scaling summer amplifier. 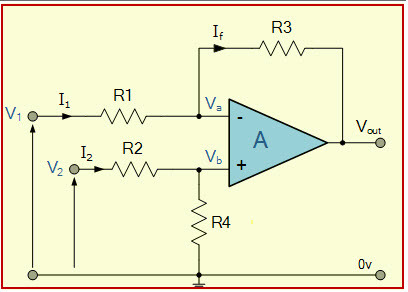 It is applicable for balanced amplifier. The gain of the non inverting amplifier circuit of the operational amplifier is easy to determine and the output of the non inverting amplifier is same as the input voltages . So, that the gain of the amplifier is exceedingly high. As the input to the op amp draws no current this means that the current flowing in the resistors R1 and R2 and the voltage at the both inputs is same. The equation of the non inverting amplifier can be called as a Vout/Vin =Av=1+R2/R1. A non inverting amplifier uses a voltage divider bias negative feedback connection. Here the voltage gain is always greater than 1. A voltage follower is also called as a unity gain amplifier, a buffer amplifier and an isolation amplifier) is an op-amp circuit which has a voltage gain of 1. This means that the op amp does not provide any amplifications to the signal. The reason it is called as a voltage follower is because the output voltage does not provide the input voltage. An op-amp circuit is very high input impedance. This high input impedance is a reason voltage follower is used. The load demands and draws a huge amount of current. This causes a huge amount of power to be drawn by the power sources. Voltage followers are also called as a voltage buffer. Voltage followers are generally used to isolate stages from each other. Voltage follower is also called as a voltage buffer. Summing amplifier is one of the application of inverting operational amplifier, but if we add another input resistor equal in values to the other input resistor, Rin we end up another op amp is called as summing amplifier. Summing amplifier is also called as a bipolar amplifier or a uni-polar converter.